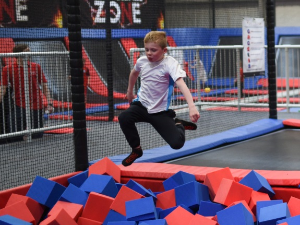 Energi Trampoline Park, is a warehouse filled wall to wall with over 100 connected trampolines, interactive games, foams pits, slam dunks, a huge airbag, parkour, kids zone, dodgeball and a cafe to refuel. Based in Wilmslow the SEN session are Wednesday during term- time from 5-6pm. These sessions are designed for children and young people with Special Educational needs and disabilities. The music is turned down low and the lights turned off. There is a chill out room available for anyone who needs space to have a quiet moment. Free juice is available after each session in the café. The sessions have been risk assessed by Right Directions who are leaders in this field . Each youngster must be accompanied on the park by a carer and these carers are able to jump for free. Sessions costs £10.25 for an hours jumping. NB Unfortunately the trampolines are not suitable for wheelchair users as the trampolines are built on an bone ground platform, accessed by steps, however the ground floor and party rooms are accessible and we have disabled toilets. Specialist sessions for children with autism and additional needs.